There is a strange sort of pleasure gained from reading a book which is set in a place you know well, and this is part of what attracted me to Clare Morrall's latest novel. 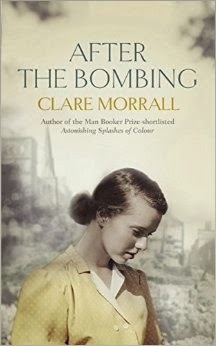 Split between the Second World War and in the 1960s, the novel tells the story of Alma Braithwaite, a young student attending school in Exeter during the bombing in 1942. Following the destruction of parts of the school, a group of girls are sent to stay at one of the University Halls with young male students. What follows is a summer in which the energy and fervour of youth are all that keep Alma going through a series of tragic events. When we return to see Alma in the 1960s, she is teaching at her former school and still living in the family home. With the recruitment of a new headmistress, Alma's world is disrupted for the first time in more than twenty years and she is forced to reconsider her life choices as she finally confronts events from the past. Despite the book's rather weighty themes of loss and bereavement, there is an energy and life to Morrall's novel, particularly in the scenes between the girls at school, where I found myself fondly recollecting the Enid Blyton school stories. There is something comforting about the way in which Alma's friend Curls shirks authority in a youthful, playful manner. I must admit to feeling there to be a certain level of implausibility to events which unfold at the final picnic, and that perhaps the additional tragedy was unnecessary, though I appreciate the author was trying to convey the fact that tragedy was very much an everyday occurrence during the war. The section set in the 1960s was rewarding in the subtle insights it offered into the lives of those living in post-war Britain. Whether it was the staff's reticence towards the prospect of an in house German teacher, or the references to the many single women left after so many men were killed. This is the more interesting side of the story in my view, and I felt the way in which Alma finally reached a point of realisation was done very well.